The revelation last week that tiny eight-legged animals survived exposure to the harsh environment of space on an Earth-orbiting mission is further support for the idea that simple life forms could travel between planets. This idea, called panspermia, is not new. It holds that the seeds of life are everywhere, and that microbial life on Earth could have traveled here from Mars or even from another star system, and then evolved into the plethora of species seen today. In essence, we may all be Martians. In various forms, the panspermia concept was discussed among scientists in the 1700s, again in the 1800s, and then notably when Sir Fed Hoyle and Chandra Wickramasinghe popularized it about 30 years ago. Mainstream scientists often dismissed the hypothesis, however, even into the 1990s. But new life has been breathed into the idea in the past decade. One big question that dogged panspermia for decades has been settled, most scientists agree: Could life endure a trip from one world to another? One key breakthrough was a 2000 study that concluded a rock from Mars, found on Earth, remained cool enough during its violent ejection from the red planet and its fiery trip through our atmosphere 16 million years later to sustain life — were there any aboard. 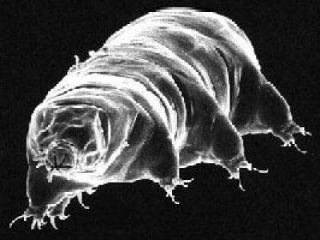 And the incredible survival tale of the tiny tardigrades, also called water bears, is a dramatic reminder that life can survive space travel. The dot-sized invertebrate creatures endured 10 days of exposure, and upon return to Earth, scientists found that even some of those exposed to solar radiation had made it through. Though it had already been shown that single-celled organisms could survive space, tardigrades are eight-legged animals on a different branch of the tree of life than microbes. "It is an exciting result that seems to support the idea that life forms could be exchanged between planets such as Earth and Mars," said David Morrison, an astrobiologist at NASA's Ames Research Center. "Now we know that species from three very different organism groups — bacteria, lichens and invertebrate animals — are able to survive at least short periods under space vacuum and also under some restricted conditions of solar radiation," said K. Ingemar Jonsson, who led the tardigrade study out of Kristianstad University in Sweden. "And if protected from sunlight, all these groups could probably survive for several months, perhaps years, in space." So to travel through space, it looks like a bug or small animal needs a rock for protection. Equally important, the creature needs a hospitable environment upon arrival. Some scientists think life might have originated on Mars and then been transported to Earth in a meteorite kicked up by an asteroid impact. "Mars had a stable crust 4.5 billion years ago, at a time when Earth was still in the throes of recovery from the moon-forming impact," said Jay Melosh of the Lunar and Planetary Lab at the University of Arizona. "So conditions on Mars were conducive to the origin of life long before those on Earth." Melosh explains what might have happened next: "Once life began on Mars, the Late Heavy Bombardment [lots of big rocks crashed into Earth and Mars about 4 billion years ago] would have provided abundant means of transport for the Mars-Earth diaspora. Given Mars' current very hostile surface environment, I would not be surprised if it petered out later (maybe some life still persists in the subsurface, living off the chemical and energetic gleanings from Mars' still-active volcanism). Melosh calls the scenario "an excellent bet." But could the reverse be true? Might life have originated on Earth and been transported to Mars? "Mars today is so hostile and lacking in food or liquid water on its surface that it is very unlikely that any such naturally transported living organisms could survive," Melosh said. Researchers figure we've sent plenty of microbes to the moon and Mars, on spacecraft. But most don't think they stand much chance of surviving. Only below the surface of Mars, where an Earth organism would find protection from radiation and where there might be liquid water, is colonization a potentially serious risk, they say. "As long as we operate on the surface of Mars, there is very little risk, since surface conditions there are so harsh," Morrison said. "Remember the issue is not simply survival, but ability to grow and reproduce." Microbes that manage to stick to a spacecraft throughout a six-month voyage to Mars are very unlikely to get off the spacecraft once there, according to research done by Andrew Schuerger of the University of Florida. And if they do jump to the ground, Schuerger said, there are 13 different "biocidal factors" that spell almost certain death to the invading species. From DNA damage to sterilization, any surviving microbes would be unlikely to successfully reproduce. Schuerger has tried multiple experiments to breed life among hardy creatures under Mars-like conditions. One major difference between Earth and Mars is the red planet's extremely thin atmosphere, about 1 percent as thick as ours. "I have not been able to get any microorganisms to grow under the conditions of Mars' surface pressure," he said in a telephone interview. "I am skeptical that a microorganism can be displaced from a spacecraft, get into the surface of Mars, and grow." Interstellar panspermia remains a highly unlikely proposition in the minds of most scientists. Multiple studies have shown that the raw material of life are common around other stars, and in fact the very seeds of life known as amino acids could also be everywhere. Life, therefore, might be common around other stars, scientists say. But getting from one star to another is another matter altogether. It would take four years just to get from our solar system to the next nearest star ... and that's if a rock was (impossibly) traveling at the speed of light. "Star-to-star hops are so unlikely and take so long to complete that I very much doubt that panspermia has occurred by this mechanism, at least by natural agencies," Melosh said. Even the "we're all Martians" idea remains a stretch for many researchers, who invoke Occam's razor (the simplest solution is often the best one). "It's plausible that our early progenitors were transported here," Schuerger said, "but I think that's a complicated method. I think it's a lot easier to say life started on Earth and evolved on Earth."